Unearthed power supplies (IT systems) are always used in situations where an initial insulation fault must not cause a protective device to respond, thereby interrupting the power supply. Classic fields of application, for example are in medically used locations, sensitive processes in the industrial sector, and feedback-controlled drives in heavy industry. New applications in electromobility and DC systems have come along as part of the paradigm shift in energy usage occurring now. This article provides an overview of the prevailing situation with respect to the standards. The basic power network types are illustrated in DIN VDE 0100-100 (VDE 0100-100):2009-06 In 131.1 of this standard, reference is made to the fact that, with these requirements, the safety of persons, livestock and property is provided against dangers and damage, provided that electrical systems are used in the intended manner. The risks involved include the occurrence of dangerous shock currents and interruptions in the power supply. 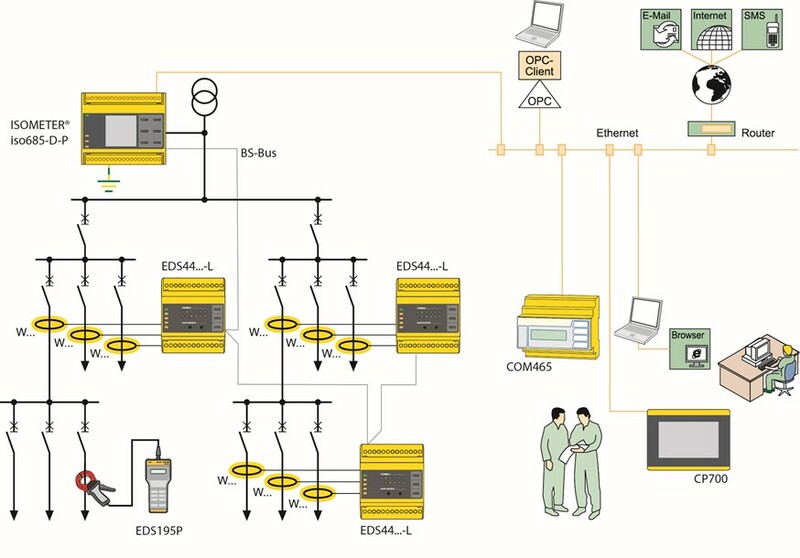 The IT system is described in IEC 60364-1:2005-11, 312.2.3 (AC) and 312.2.4.5 (DC). 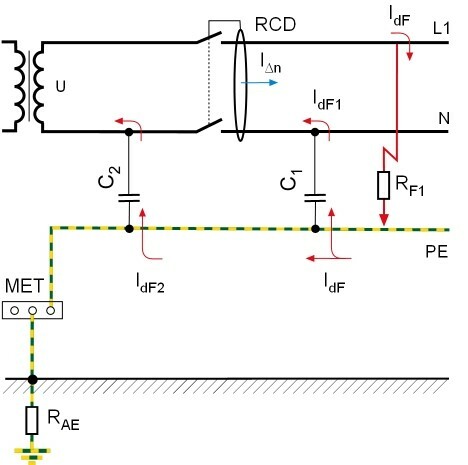 The definition states that all active components must be isolated from earth or that one point must be connected to earth via an impedance. The exposed-conductive-parts (of electrical equipment items) on the electrical system are either earthed individually, in groups or collectively with the system's earth (also refer to IEC 60364-4-41:2017-03, 411.6). The system may also be connected to earth via a sufficiently high impedance. In Germany, this is only applied for measurement or functional purposes. A distinction must be made between the power source for a "normal" IT system and for a medical IT system. Disconnection in the form of basic insulation is required for the power source. In practice, this usually takes the form of an isolating transformer. This function can also be performed by a battery, by a standalone photovoltaic (PV) system or by a mobile power generator. 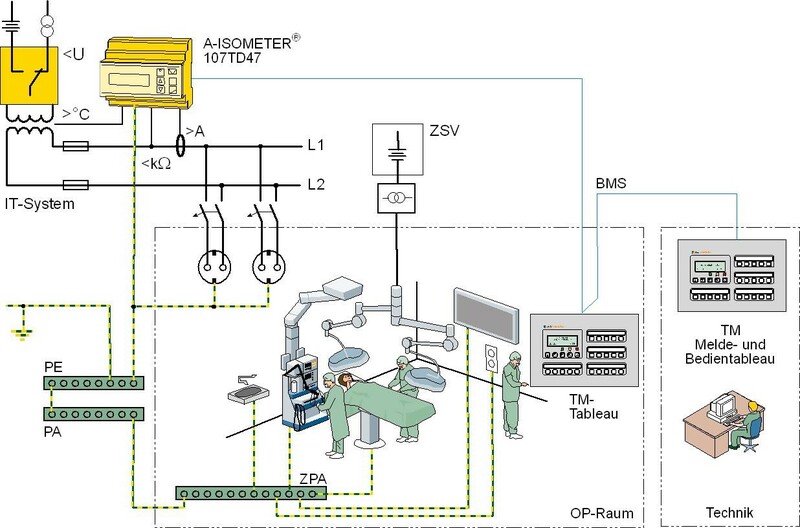 In a medical IT system, the leakage currents during intracardial interventions (e.g. open-heart surgery) must be extremely low given the potential risk to the patient. 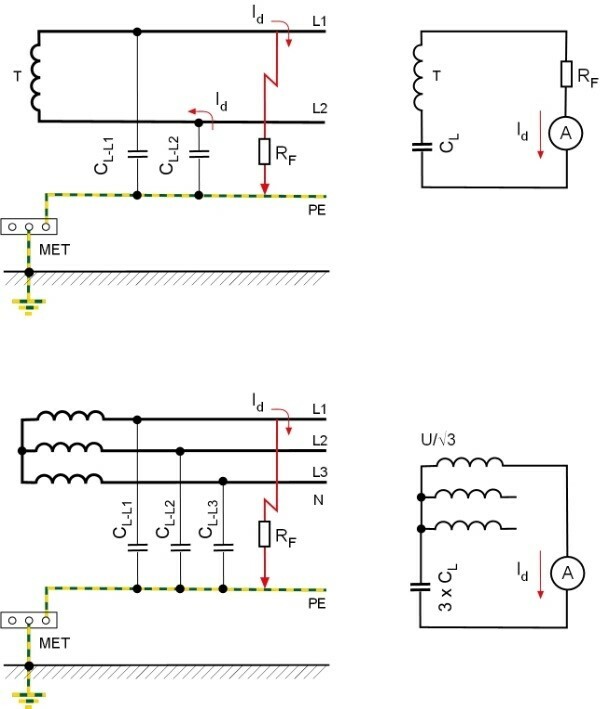 The required isolating transformer is described in IEC 61558-2-15:2011-11. 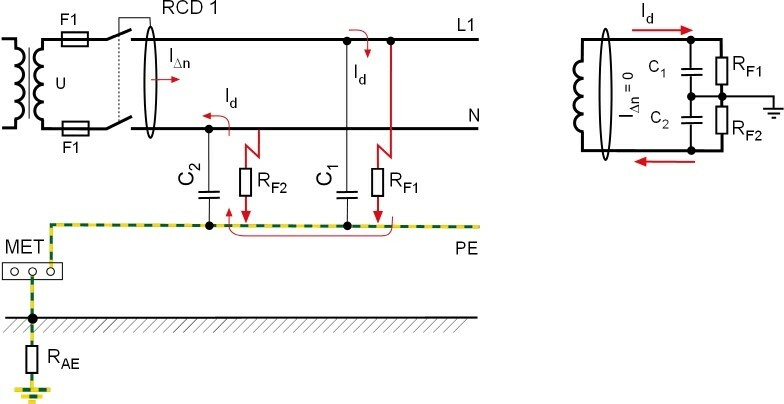 Id the fault current in A of the first fault with negligible impedance between a line conductor and an exposed-conductive-part. No touch voltage limitation is considered in d.c. systems as the value of Id can be considered to be negligibly low. 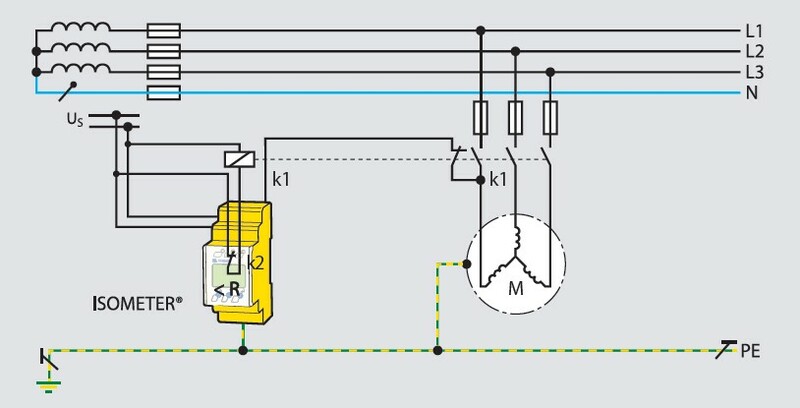 The fault current Id following the occurrence of a first fault against an exposed-conductive-part or earth is very low, and automatic shutdown is not necessary (IEC 60364-4-41:2017-03, 411.6.1), presupposing that the earthing requirement defined in Section 411.6.2 has been satisfied. This means that the protective conductor resistance RA is parallel to the body resistance and that the already very low fault current flows through this protective conductor and that the touch voltage remains significantly below the maximum permitted value of 50 V in AC systems. This is of particular benefit in the medical sector. Fault current protective devices (RCDs). Subclause 411.6.3.1 defines that an insulation monitoring device (IMD) is required to report a first fault between a live part and an exposed-conductive-part or to earth. This device must issue an audible and/or visible signal that must last for as long as the insulation fault exists. It is advisable that a first fault is remedied as fast as practically feasible. "As fast as practically feasible" depends on the practical parameters relating to the system. Fundamentally, the IT system has a significant advantage in that an insulation fault does not have to be eliminated immediately but can instead by delayed, e.g., until the next maintenance interval for the system is due. With an insulation fault locating system (IFLS), faulty outputs and/or devices can be located during operation, i.e. there is no need to shut down the system. For troubleshooting purposes, measuring pulses are superimposed on the IT system that are in turn picked up and evaluated by measuring current transformers. Based on the assignment of the measuring current transformer/output, it is then easy to identify the faulty output. In accordance with IEC 60364-4-43:2008-08, 431.1.1, all live conductors must be protected (all poles). With reference to IEC 60364-5-55:2011+A1:2012, clause 557 ("Auxiliary circuits"), 557.3.6.1 states that "Unearthed a.c or d.c auxiliary circuits shall be protected against short-circuit currents by protective devices interrupting all line conductors". The same message can also be found in IEC 60364-4-43:2008-08, 431.2.2. 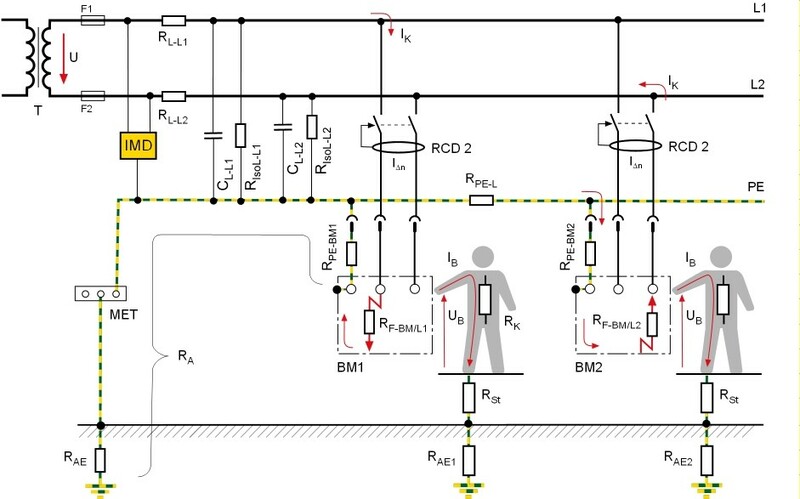 If overcurrent detection is needed for the neutral (N) conductor of 3-phase/N IT systems, this must cause all live conductors to be disconnected (IEC 60364-4-43:2008-08, subclause 431.2.2). This overcurrent protective device can be dispensed with if, for example, the N conductor is protected from overcurrent on the supply side. At this point, a comment on the generally applicable comment from IEC 60364-4-43:2008-08, 433.3.3, that overload protective devices can be omitted for circuits supplying current-using equipment if an unexpected disconnection of the circuit constitutes a risk. In such cases, an overload alarm should be considered. In acc. with IEC 60364-4-41:2017-03 subclause 411.3.3, additional protection must be provided in AC voltage systems in the form of fault current protective devices (RCDs) for < 32 A sockets that are intended for use by non-specialists and for general use. However, this requirement is not practicable in allowing RCDs to achieve the desired protective action in IT systems. For a start, the operating principle of an RCD after a first fault requires a fault current Id that must be above the rated fault current IDn of an RCD (e.g. > 30 mA). However, in practice, this is not the case. Even two independent insulation faults at both live conductors or connected equipment items do not cause an RCD to trip because these two faults act like a load. Apart from the fact that sockets are the exception rather than the norm in IT systems, how should the fault current Id be even determined in the planning phase? The fault current Id is determined mainly by the cable length and the number of loads as well as the leakage currents of the electrical system to earth. However, no planner can determine these variables with even the best of planning. RCDs currently available on the market do not have a response value of IDn < 15 mA. In addition, the German DIN VDE 0100-530 (VDE 0100-530):2018-06, 538.4 states that discriminating (direction selective) residual current devices are recommended in AC IT systems to avoid unwanted notifications/alarms due to leakage currents when high leakage capacitances are likely to occur downstream of where the residual current device is connected. The problem here is that such discriminating RCDs are also not available. The German standard DIN VDE 0100-420 (VDE 0100-420):2016-02, Section 421.7 does not include any requirements for electrical systems used in the field of application of DIN VDE 0100-710 (VDE 0100-710):2012-10, subclause 710.1. Areas used for medical purposes in senior citizen homes and care facilities in which patients receive medical treatment are not therefore included within the scope of DIN VDE 0100-420 (VDE 0100-420):2016-02, 421.7.
for electrical systems for safety purposes in accordance with DIN VDE 0100-560 (VDE 0100-560), in particular in safety lighting systems. In cases where several IT systems are connected together, only one IMD must ever be active. It is advisable to use IMDs that report any interruption in the measuring connections to power circuit conductors and earth. The response value must be set appropriately for the affected system. In accordance with the German standard subclause 538.1.3, a value of 100 Ω/V and, for prewarning, a value of 300 Ohm/V is recommended. In the previous edition of the standard, a guide value of 50 Ω/V is recommended. Both parameters are correct in principle and are influenced by the number of consumers and by the quality of the installation (e.g., humidity, dust etc.). In practice, the value displayed on the screen of the IMD is used to set an alarm value that is less than this displayed value, and that therefore represents the desired minimum value, leaving sufficient latitude for service and maintenance work. Also bear in mind here that all important system outputs are also in operation. However, another advantage is that any significant change to the insulation resistance by switching on or off a load or system component is displayed by the IMD, enabling potential weaknesses to be identified. In accordance with VDE 0100-530 (VDE 0100-530):2011-06, subclause 538.3, an insulation monitoring device in TN, TT and IT systems can be used to monitor circuits that are switched off. This can, for example, include motorised winches, elevators and slide valve drives. This requires that the monitored electrical circuits are isolated from all poles of the system. Ia = Current (in A) that causes a protective device to be triggered within a time period defined in subclauses 411.3.2.2 / 411.3.2.3. 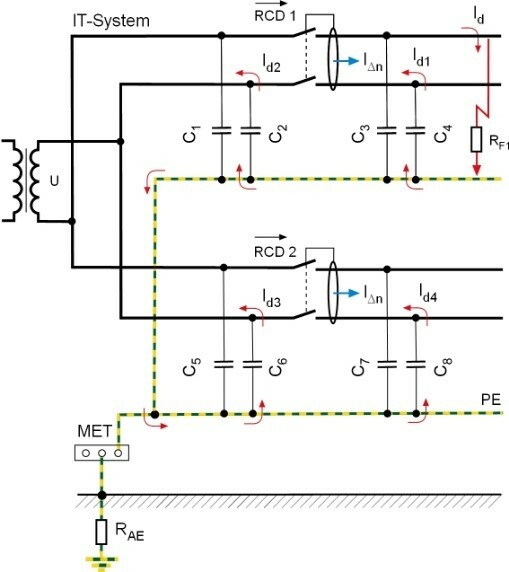 If for reasons of availability, if the system is not intended to shut down when an initial fault occurs, ensure that the prevailing fault current Id is < 0.4 IΔn when using RCDs. For a 30 mA RCD this means that Id is < 12 mA. Additionally, it should be stated that symmetrical faults on different live conductors should never cause a fault current that causes a system to shut down. IEC 60364-4-43:2008-08 subclause 431.2.2 includes a comment to the effect that it advisable not to route an N conductor in IT systems. 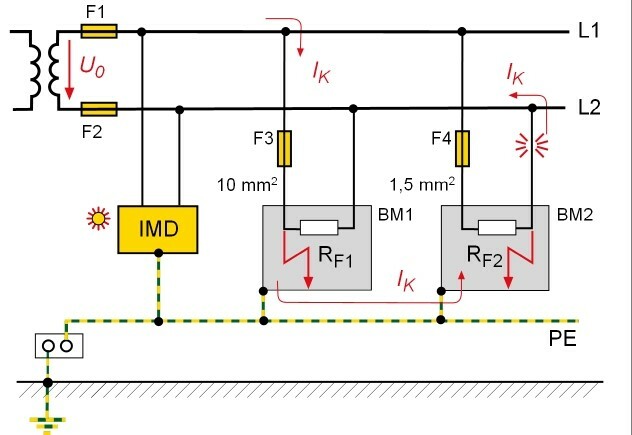 This should be taken into account whenever single-phase loads are also connected to a 3-phase/N IT system. 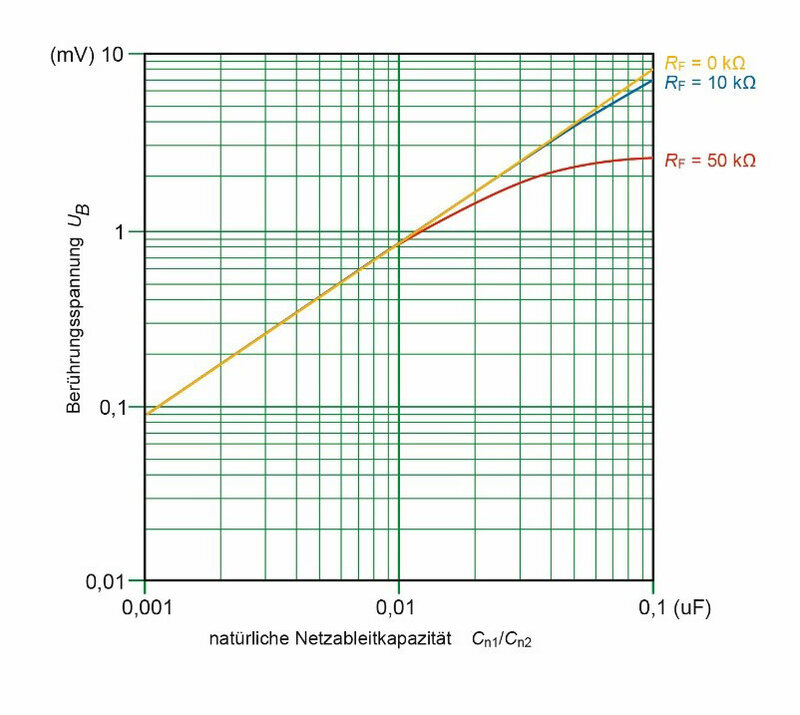 If an insulation fault occurs in L1, the voltage on conductors L2/L3 to earth is increased to the phase-to-phase voltage, e.g., 400 V. This could damage suppression capacitors that are switched to earth. Ensure that the voltage offset only affects the voltage to earth. No voltage offset between active conductors arises. Single-phase equipment must be configured appropriately, i.e., they must be suitable for operation in 3-phase /N systems. In practice, two separate IT systems are frequently set up, one for single-phase loads and one for 3-phase loads. At this point, a comment on the generally applicable comment from IEC 60364-4-43:2008-08 sub-clause 433.3.3, that overload protective devices can be omitted if an unexpected disconnection of the circuit constitutes a source of risk. In such cases, an overload alarm should be considered. IT systems are always of greatest benefit when they protect against the disconnection of the power supply in the event of a first fault. The fundamental basis for fault-free and safe operation comprises setting the system up in accordance with the standards and the correct choice of protective and monitoring devices. Standards can be obtained from VDE-Verlag [publishers] or Beuth.